An unintended theme of this blog has been the difference between the Solar System of SF imagination and the real Solar System we are beginning to explore. The real place is even more complex and beautiful, but also more hostile to human life than Heinlein or Clarke ever imagined. Mars looks wonderfully like Arizona, but it is fiercely unlike Arizona. The real future of the Solar System will be likewise unlike what Clarke or especially Heinlein imagined. Robert Anson Heinlein had godlike powers, but he was also the greatest Bat Durston of them all, the great-grandfather of Firefly (not a bad thing to be). Alas, Mars is fiercely unlike Arizona, and the other planets even more so. Heinlein in the end was writing space opera. Even in the 1950s little hope remained that Mars had canals, and no one yet had any reason to dream that it had canyons. Yet these ideas have gotten deeply rooted in space thinking, with the result that the future of the Solar System is usually pictured as more or less like Montana (rather than Arizona) around 1880, minus the labor unrest. Rare and Valuable Space Stuff is mined out of asteroids, or the surface of Mars, or wherever, along with other more ordinary stuff. 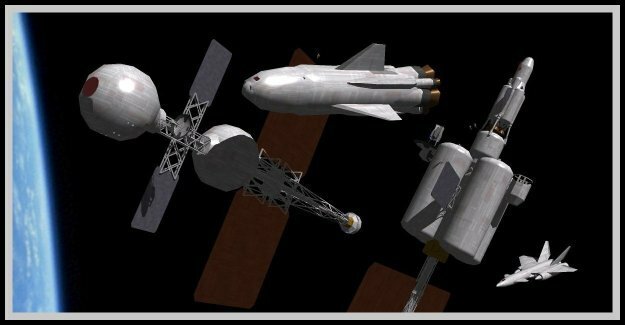 The ordinary stuff is used in space, to build spaceships and habitats, and provide them with equipment, fuel, basic nutrients, air, and so forth. The R&VSS is shipped back to Earth, where it literally pays the freight for everything still being shipped out into space. And the population in space grows until jumbo habs are built, or Mars terraformed, and eventually you have tenth generation Martians or Belters or whatever. It might happen. But it is not particularly likely to happen, at any rate not in the midfuture, the next couple or three centuries about which we can half plausibly speculate. And if it does not happen, that does not mean that we have Turned Our Back on the Universe. Let me propose an alternate space future, in barest outline. We go into space, at bottom, because we can. Who wouldn't want to stand on one edge of the Valle Marinaris, or just float there looking at the rings of Saturn? We gloss it up as science, and this actually has worked out more than well. We went into space and almost immediately discovered a habitable planet, this one. We discovered that it is vulnerable to our own activity in ways that only a spacefaring civilization could observe. In the unlikely event that anyone keeps moral books, that knowledge has prepaid for the space program through this millennium. But the space program is in any case popular, and that alone keeps it going. From political perspective NASA is like Amtrak, with much faster trains though dreadfully high fares. Both have survived people who think that government spending on any vehicle is bad unless it blows other people up, and people who think that government spending on anything big, shiny, noisy, and fast (or any three of the above) is bad. Even without inspired leadership for most of their history, both agencies have survived. Barring calamity this will not suddenly end. Trains may be poised for a comeback, and perhaps spacecraft as well. Sufficient blunders might kill space travel, but otherwise we are pushing steadily if gradually outward, driven mainly by a modest but steady reservoir of public support for doing things in space. Space is also a difficult, hostile, and therefore expensive place to live. There is absolutely no reason to think that people in 2109 or even 2309 will be lining up to emigrate to Ganymede, or nowadays Europa or a hab, in search of a freer and more comfortable life away from dystopian 1950s-future Earth. But space travel is fundamentally tourism, and most tourists have no expectation or intent of living on the edge of the Grand Canyon, let alone the bottom of the Great Barrier Reef. In short, I suggest that space industrialization and colonization are both incidental to rather than central to the human enterprise of space. We may colonize some places, but we will go many places that we never colonize. If side by side you have the University of Mars and the Hotel Mars, someone will probably figure a way to supply stuff locally rather than pay $10,000 for a cinder block. And Marsport may turn into a town. Or conditions may just be too difficult and expensive for couples to raise children there. We will go into space, whether or not some of us stay permanently, and whether or not we bring back more, physically, than samples and curios. We will do things on other worlds that we couldn't imagine till we got there. Someone will find out that burgundy grapes grown in a Martian greenhouse have a distinct flavor. Pretty soon they are shipping back little airline size bottles that sell for $500, with just enough for a toast, and 'robustly Martian' ends up being used to describe burgundies from lands where Charles the Bold once ruled. Using these distant places as literal 'way stations' on an interstellar mission do not hold up (though there could conceivably be powerful lasers pre-positioned out there to help scoot a starcraft along). But before we ever attempt a true interstellar mission they are further shores, one beyond another, till the Solar System does not so much end as slip gracefully away into the interstellar depths. There is plenty to keep us busy for a very long time to come.